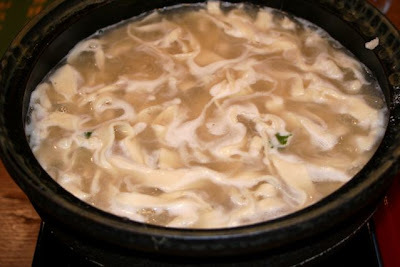 It has been almost a year since I’ve made shabu shabu at home. 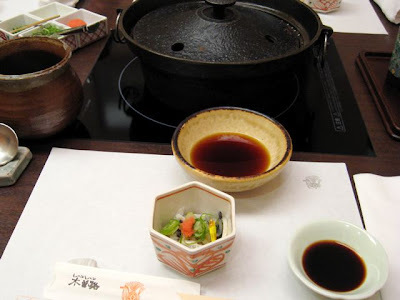 Although I did report about a wonderful shabu shabu dinner I had in Japan in December. 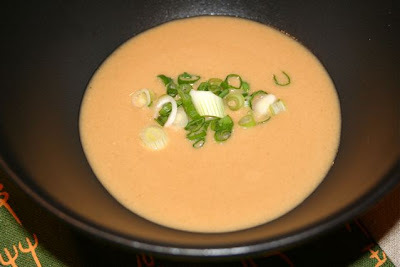 I actually made this meal a few weeks ago but am just getting around to blogging about it now. Please forgive me for being so late with my offering. 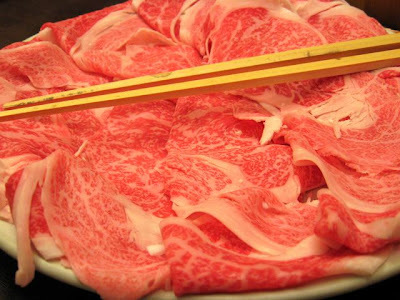 Shabu shabu is traditionally made with beef that is sliced paper thin. 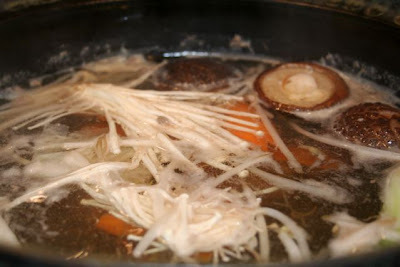 The name comes from the sound the beef makes as you swish it back and forth with your chopsticks in a pot of boiling broth. This is a wonderful family meal where everyone gets to share in cooking the meal at the table. 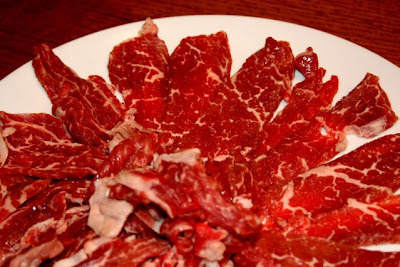 My sirloin is not as marbled with fat as is usual for shabu shabu. I have some lean grass fed local beef that is still flavorful but also much healthier for you. 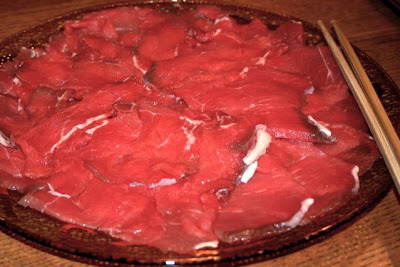 Since the beef is only barely cooked, the texture still comes out tender even without the fat. 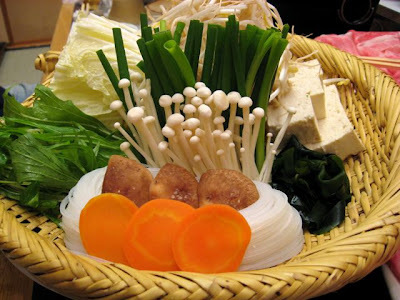 Shabu shabu also requires that you cook vegetables in the broth after you eat the beef. 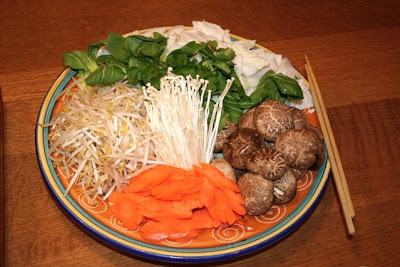 Here are bean sprouts, enoki mushrooms, shitake mushrooms, carrots, baby bok choy and napa cabbage ready to be cooked. 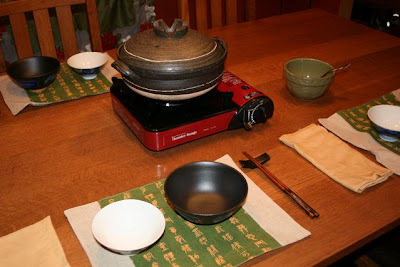 The table is all set with my nabe pot on the burner. 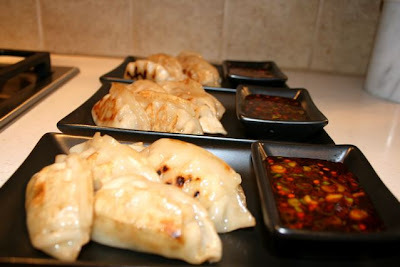 Before we sat down to eat the shabu shabu I fried up some frozen gyoza and served them with a spicy chili vinegar sauce. The pot is heating up. 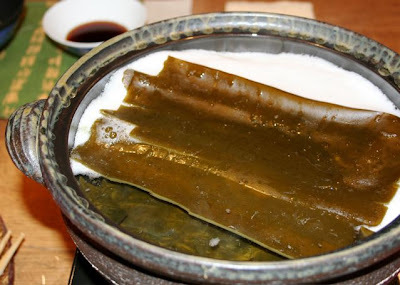 I have been soaking this kombu in the pot of water for a few hours to flavor the broth. 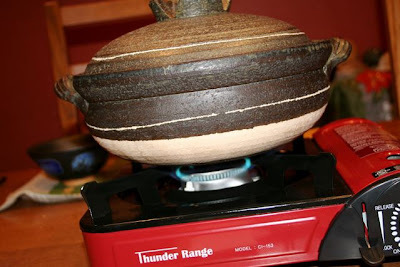 This was removed once the pot came up to boiling. 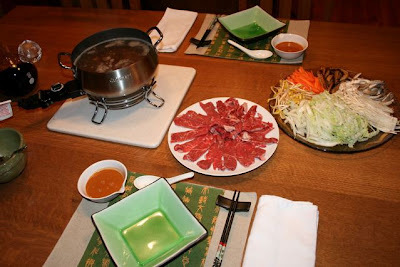 I served two dipping sauces for my shabu shabu tonight. 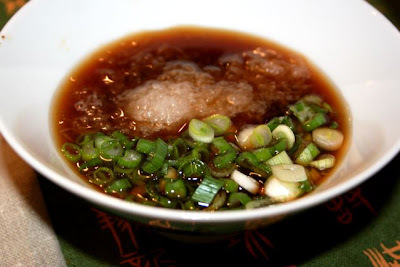 The first has soy, vinegar, green onions and grated daikon radish. 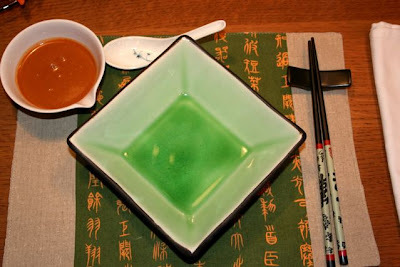 The second sauce is made from sesame paste, soy and vinegar. We’ve eaten the meat and now it’s time for the veggies. 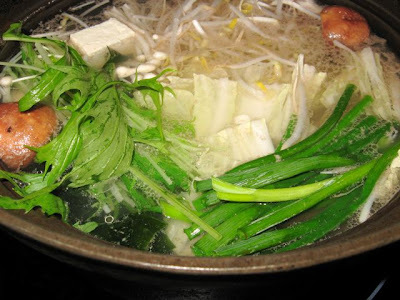 After you have had your fill of meat and vegetables, the broth that has been flavored even more intensely by all the food being cooked in it is used to prepare noodles. 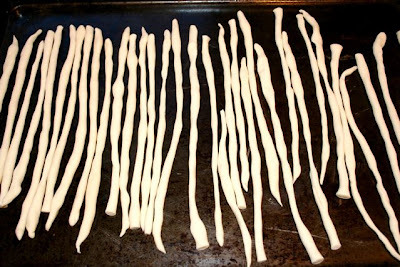 These udon noodles were made from scratch and cut just before cooking. 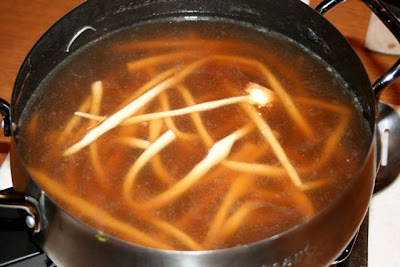 The udon is cooking nicely. Yum! Comfort food all the way. Perfect on a cold winter’s evening. 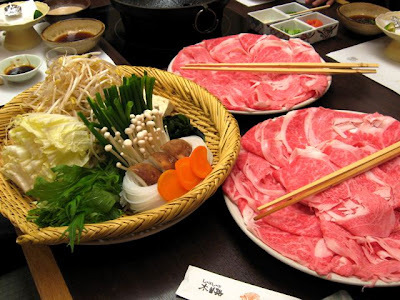 Shabu shabu is another nabe dish made by taking paper thin slices of beef and dipping them into a pot of boiling water or broth for just a few seconds to cook. More on the food in a second. Let me first describe my Thursday in Kobe. This is a wonderful city just west of Osaka. 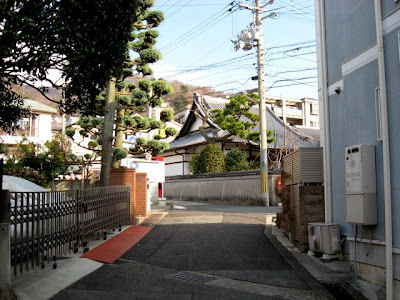 Kobe Pharmaceutical University sits on the hillside looking down upon Kobe’s numerous narrow winding streets. This picture shows one of their WIDE streets! Imagine a street as wide as one car twisting and turning through densly packed homes up the side of a hill. Their big taxis climb those hills every day. 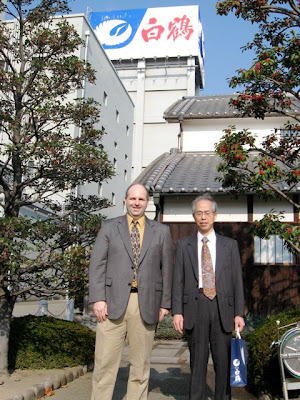 In the morning my host Naito Sensei took me to the Hatsukura sake factory for a tour of their sake museum. 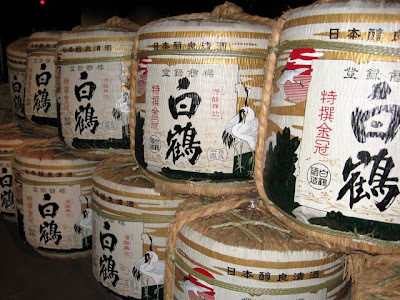 There I learned all about how rice is polished, infused with koji spores to convert starch to sugar, and then fermented with yeast. Of course we left with a taste and a bottle! 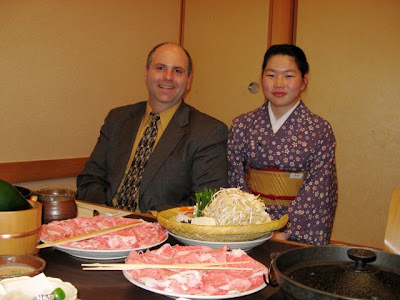 Dinner that evening was a slighly formal shabu shabu dinner. 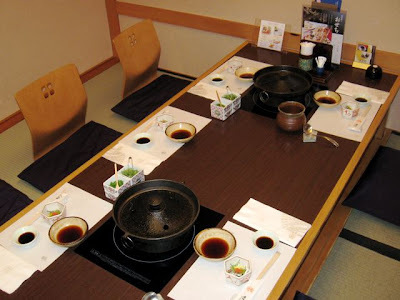 We ate at a traditional low table on the tatami mats. Actually there was a hole under the table for your feet so you didn’t have to sit cross legged for hours. 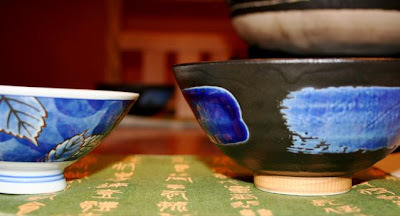 See the nabe pots ready for action? 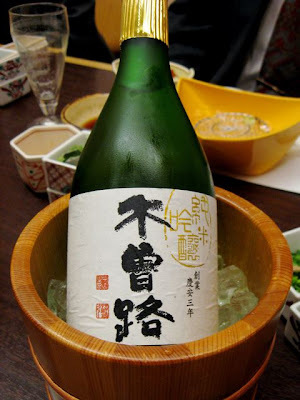 This sake is made especially for this restaurant. I have to say it was quite good. 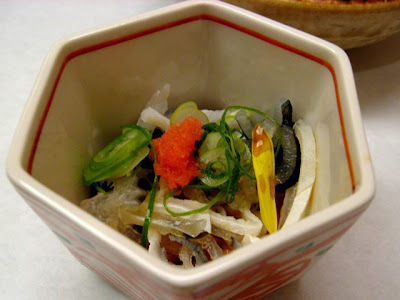 We started with a small appetizer of marinated raw fugu. 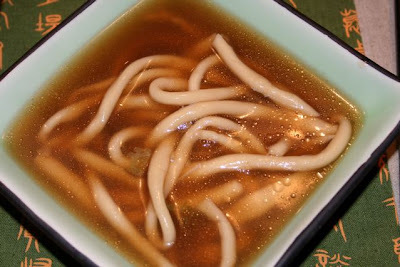 I would call it a Japanese seviche with its vinegary marinade. 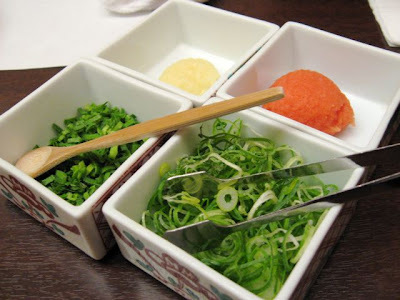 This is onion, garlic, radish and chives to garnish the dipping sauces for the shabu shabu. 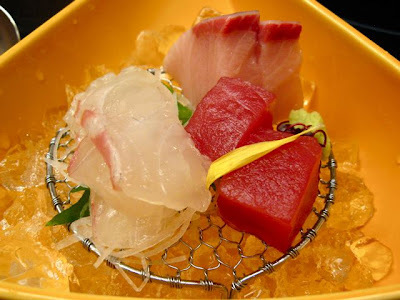 A sashimi course, of course! 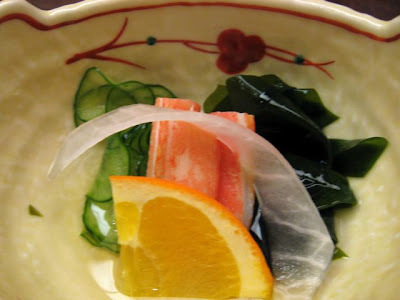 A bite of crab, seaweed and cucumbers. This is a bit of fried monkfish. The chili was not very spicy. 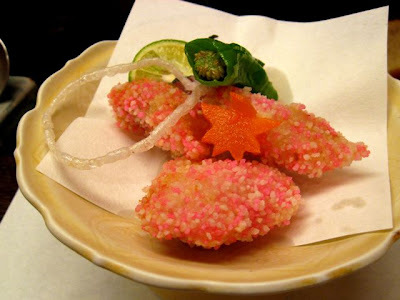 I’ve never seen a pink batter before. Very festive for the holiday season. Our sever brought the plates of beef and vegetables. I am always in awe of the wonderfully marbled beef. 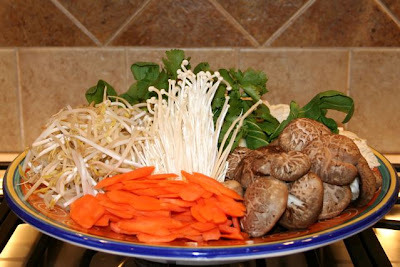 Makes for tender shabu shabu. Our server demonstrated the shabu shabu technique. 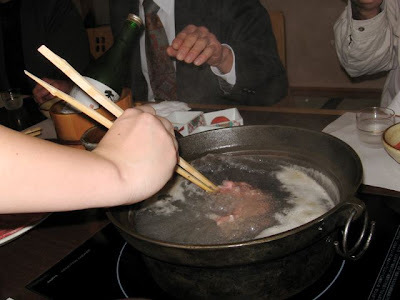 Grasp the beef slice with your chopsticks and swish it back and forth in the boiling pot for just a few seconds. 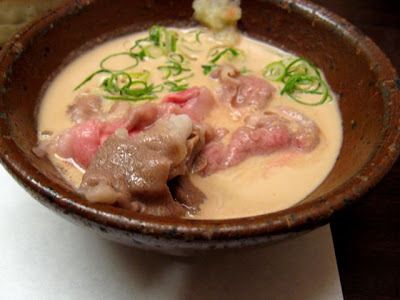 The dish is names shabu shabu after the sound of the beef swishing in the broth. 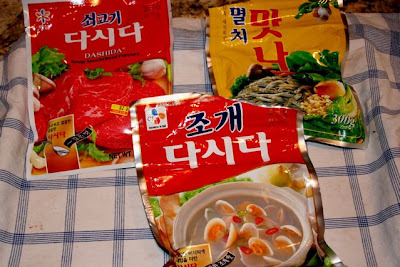 The flash cooked beef is immediately plunged into a bowl containing a sesame sauce and eaten. After the meat is eaten, next come the vegetables. 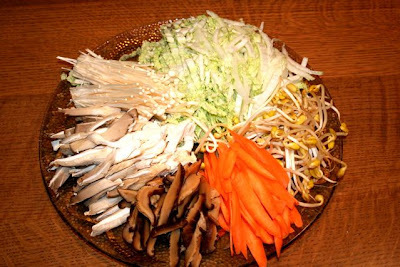 Here you can see tofu, enoki mushrooms, green onions, bean sprouts, mushrooms, carrots, some greens and napa cabbage. 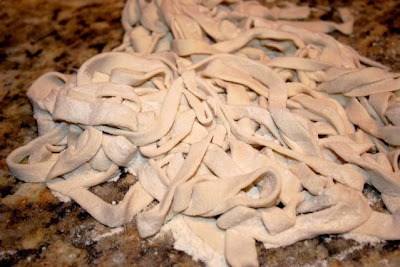 The noodles are for the end of the meal. 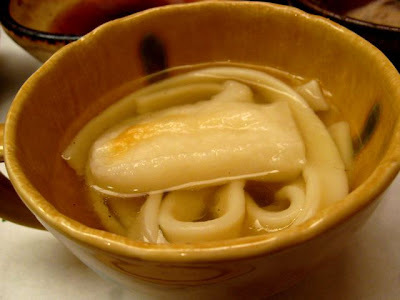 We had two kinds of noodles – the clear ones you see served with the vegetables above and these wider noodles that were brought to the table after the vegetables. 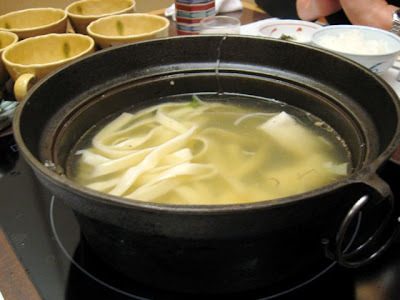 Also in the pot are some sticky rice cakes cooked along with the noodles. 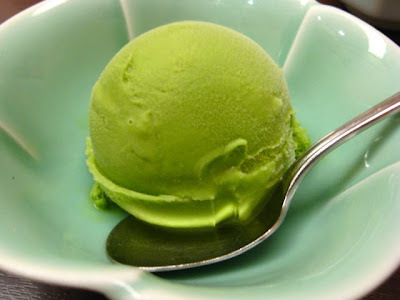 A perfect end for a wonderul meal – a bowl of macha green tea ice cream. I like the fact that this ice cream is not as sweet as our American versions.